Louis Malfaro, treasurer of the Texas American Federation of Teachers, speaking at Lucy Reed Pre-K Elementary School in reaction to Greg Abbott's pre-K Campaign platform. Teachers who are endorsing Democrat Wendy Davis for governor say Republican Greg Abbott was wrong for calling it a “waste to expand access” to state pre-K programs. But there are some who agree with the idea that quality should come before quantity. While campaigning in South Texas this week, Abbott laid out the first of three components of his campaign’s education platforms. When it comes to early childhood education, Abbott is proposing the state provide school districts $1,500 per student if they adopt a certain type of pre-K curriculum. Districts being funded by the state would also be required to test each pre-K student for benchmarks. 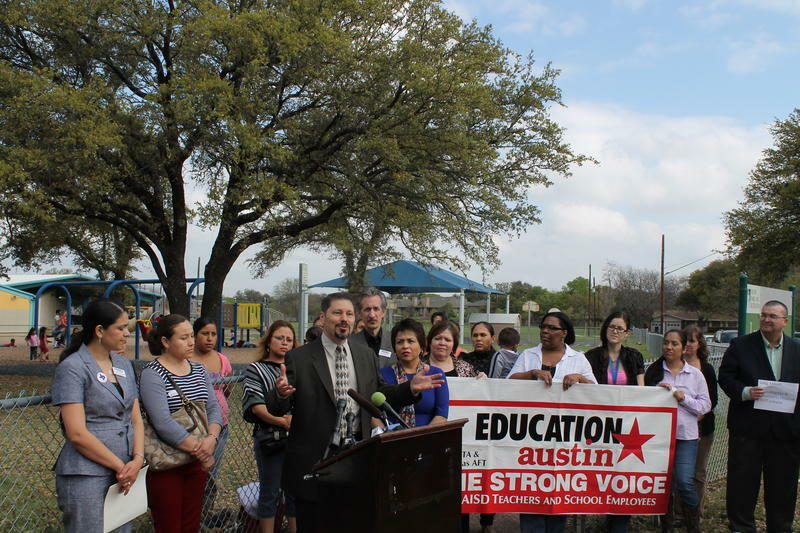 Educators from various teachers unions met in front of Austin’s Lucy Reed Pre-K Elementary School on Tuesday to take issue with Abbott’s campaign platform, and named specifically his desire to further study the effectiveness of pre-K programs. “We need some new leadership in this state that isn’t going to twiddle it’s thumbs and say, 'We need to study the problem some more.' We know what the problem is, we know what the solutions are, and they are investing in those people right there," said Louis Malfaro with the Texas American Federation of Teachers, pointing back to a playground full of four year olds on their recess break. Malfaro said their group doesn't disagree with a need for quality, but he said as teachers they already have an idea of what that looks like. Chuck DeVore with the Texas Public Policy Foundation, a conservative think-tank, said there is only a small number of studies that say pre-K programs play an effective role in a child’s education. “The studies that have been done to the highest fidelity, that look at the statistics properly, would indicate that pre-K programs don’t have a return on their investment -- at least as currently constructed," DeVore said. But the question remains as to how best to nurture a child's education. 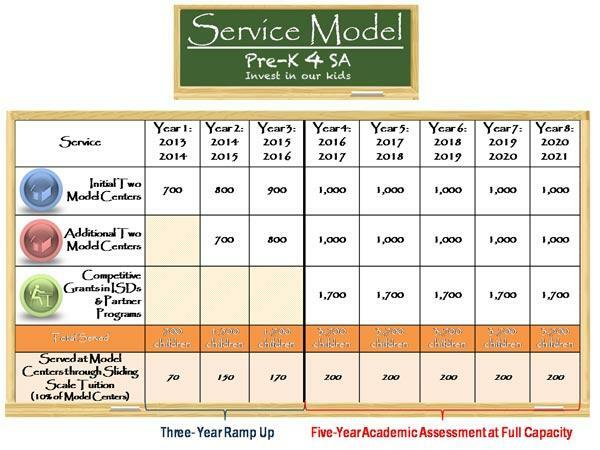 "Given that numerous studies have shown that academic fade occurs by the 3rd or 4th grade, there appears to be little to no difference at all for kids who have gone through pre-K programs,” DeVore said. 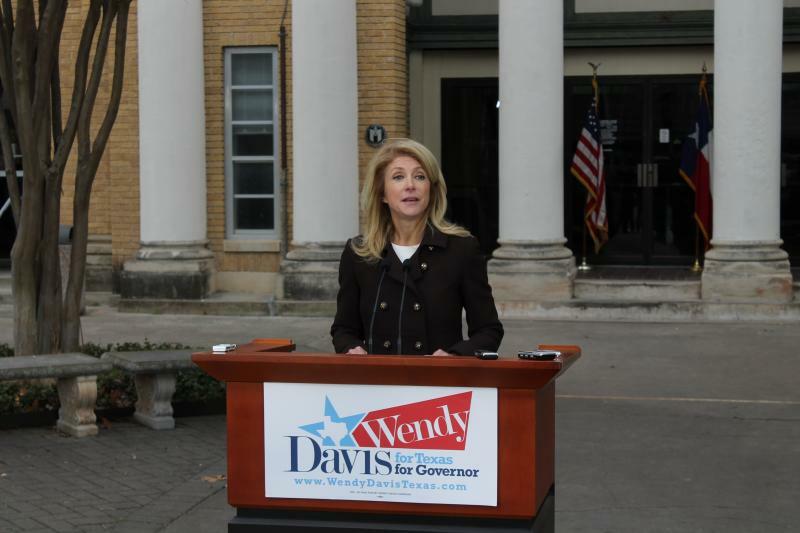 Davis’ campaign, along with teachers unions, are calling for universal access to an all-day pre-K education. DeVore said investing in expanding access and all-day pre-K would be nothing more than state-funded daycare. 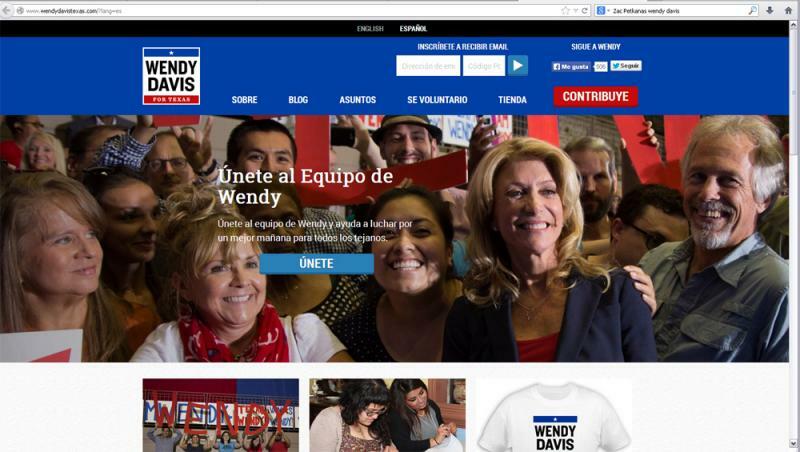 This week Democratic and Republican candidates for governor Wendy Davis and Greg Abbott both launched separate online efforts to reach Latino voters. Abbott’s online campaign ad details how multiculturalism works for a modern-day Texas. The ad features Abbott’s mixed-race family. Update (4:40 p.m.): Mayor Julián Castro and state Sen. Leticia Van De Putte joined Democratic gubernatorial candidate Wendy Davis in San Antonio to support the rollout of the her pre-K campaign platform. The three drummed up support from lawmakers, teachers and parents at San Antonio’s Amando Leal Middle School. Van De Putte, who is running for lieutenant governor, said that she and Davis intend to make sure every business gets quality employees who have a great start when it comes to education. According to Interim Superintendent Rey Madrigal, Harlandale ISD is growing each year despite a lack of new housing developments. He said this year enrollment increased by 217 students. For city council members, this means neighborhoods are being revitalized with younger families, and also more children to fill pre-K classes.